Newland Homes has opened Barbican Walk, a 21-home exclusively private development within walking distance of Barnstaple town centre. Located on Chester Terrace, just off Barbican Road, Barbican Walk provides a choice of two, three and four-bedroom homes built to a high specification and considered design. All homes come with two parking spaces and selected properties also benefit from an additional garage. Visitors can see for themselves the quality of the build and the highly inclusive specification in the showhome, a three-bedroom Tetbury style home. The Tetbury is set across three storeys and has a magnificent galleried landing to master bedroom, ensuite shower room and walk-in wardrobe. With French doors opening onto the garden from the living room, the light flows through the ground floor and also makes this home ideal for families and entertaining. The two-bedroom Sandridge home has a superbly integrated kitchen, downstairs cloakroom and wide aspect French doors to rear garden, as well as both bedrooms being large enough for double beds. It is ideal for those looking for their first home, as well as growing families looking for extra space and convenience. 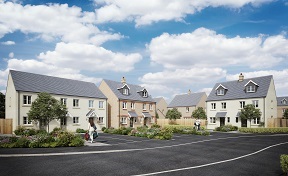 A range of detached homes will also be available in the coming months, comprising the four-bedroom Holbourne and the three-bedroom Hinton. The Hinton boasts an open plan kitchen/dining space for contemporary living, plus master bedroom with an ensuite and walk in wardrobe. The Holbourne is a four-double bedroom, three storey, detached home with triple aspect kitchen/dining room and double aspect living room with feature bay window. The master bedroom has twin built-in wardrobes as well as an ensuite shower room. Additionally, the home has been designed with useful features including a downstairs wc/laundry room with space for a washing machine and tumble dryer. Gail Remnant, Associate Sales Director for Newland Homes, said: “Barbican Walk offers an excellent choice of homes from two-bedroom houses to larger four-bedroom homes. All homes are built to a high standard and include high performance insulation and efficient heating systems, as well as quality fittings as standard.